I've written about the black IPA I brewed here. In that post I mentioned that by the time I got to brew day, some modifications and changes had been made to the basic idea. This is an entry just to update on what those changes were. The ever helpful Mr Kelly Ryan gave me a hand with the recipe and hopping schedule (many thanks). He also persuaded me, in a round about way, to drop the Fuggles from the recipe. Centennial were called off the bench as a replacement, the thought process being that they would bring more fruitiness and less spicy-grass, to the table. 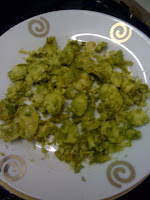 Amarillo hops, ready for action. The grain bill also underwent some tweaking, the crystal malt being removed entirely. At the last minute my mind swung back in the direction of a more traditional IPA, and I just thought it might work better if it was little dryer and less sweet. On the day, I was aiming at an OG of 1060, but actually hit 1063. 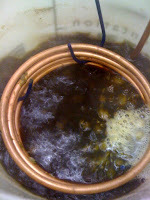 I ended up two litres of wort short, so that'll probably be why. I stuck with the Belgian yeast and S04 as a control, both of which hit a final gravity of 1014, giving an ABV of roughly 6.7%. Estimated IBU's come in at around 60-65. It's been in the bottle for four weeks now, by my reckoning it still needs at least three more before it's ready to drink. I'll post an update when I crack open a sample. Small update: Since writing this entry, I've opened a sample to see how things are progressing. At 5 weeks in, both versions are still very green. You get burning alcohol upfront, a massive hit of hop and then over the top caramel sweetness. It tastes like a lower ABV beer at 2 weeks. Based on this, 7 weeks might be a bit optimistic. I don't think this beer will hit it's peak for quite some time.